This map was made in the Sarah Wroot style. It’s a hand-drawn style with colorful shading that has an interesting and unique visual appeal. It’s a large file (~500 kb), so prepare for a long wait if you’re on a slow connection. I wanted to make it big enough to see the details. Wow! I definitely want to use this for my Dungeons & Dragons campaign! I already have wonderful ideas for missions and characters! Hello. I love this map! You did a wonderful job! I was wondering if you were able to take the names off of the map. I’m writing a novel and I can’t seem to draw my own map, and I would love to use this one. Lemme know if that would be okay. Hi Bartimus. You can definitely use the map for anything non-commercial – you can see the details of my license here. I was looking into getting CC3, but sadly, they don’t have it for Macs. 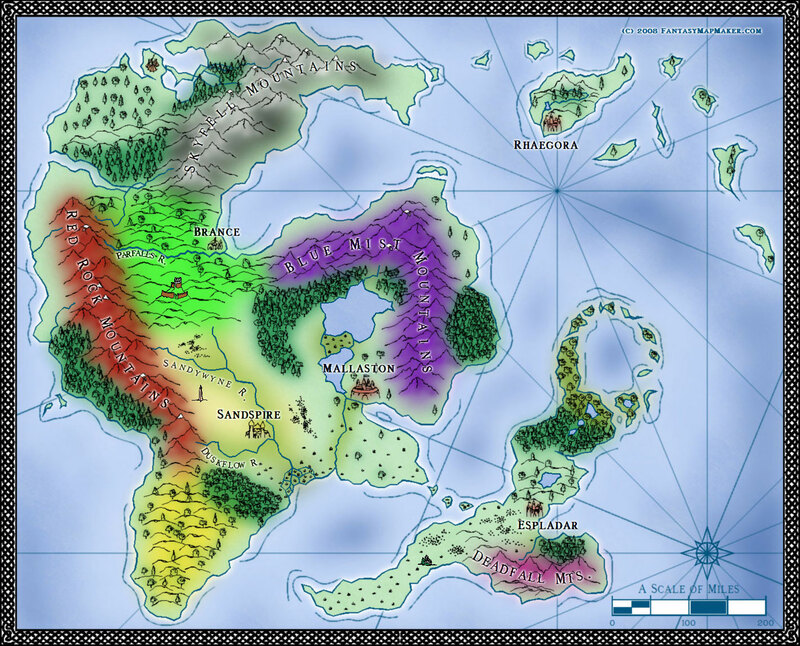 I’m running a role play website right now and was looking into altering one of your beautiful maps slightly to use, but I can’t quite figure out how to download the image at it’s full size. Macs are funny things. Any ideas? Thank you for the compliment Jamie-Lee. I haven’t used a Mac since… well, a long time ago, so I’m not sure how to answer that. If you had a PC-based mouse, you could just right click on the image thumbnail and select “open in new tab” or middle-click. I think the Mac mouse has a similar function to pull up a menu, but not sure. If you can’t get it to work, let me know and I’ll send you a copy you can click here to get it. Just wanted to let you know that this map worked great at landgrab. Looking forward to others. Thanx a bunch. i think imma use part of this map for a story im making, of course moulding it to fit my purposes. just wonderin if u were still making maps? I’m a student interested in writing fantasy and I need a map to base my mini book off of. Am I allowed to use this one and if i am can i pls. Thank You. Great job on the map. Yes, you absolutely can use it. thank you. Its a very nice map. Really gorgeous map. Cool to see stuff like this out there for free for people to use.